It takes power to stand up for yourself. And knowledge. How do you self-advocate if you don’t have access to the tools needed to improve your life? How do you reach self-reliance? And, finally, it takes a community having your back. Do like-minded community members see your potential and your struggle? Do they believe in you? Wro Adaneche, a married mother of two young children, joined the Roots Ethiopia Self-Help Group program in January 2018. The mission of an SHG is to gather community members with the least amount of resources into a network that nourishes their strengths, broadens their practical and entrepreneurial skill sets, and gives bloom to their small business potential. All while providing a safe space for camaraderie and mentoring. Through her participation in her SHG, Adaneche improved her injera business at a nearby market. Perhaps even more importantly, Adaneche’s confidence and economic savvy has soared over the last year. She observed that her husband Ato Yohannes was “killing himself” working as a donkey cart driver, driving a cart that belonged to others. Despite his long hours and grueling physical work, he’d have to turn over the bulk of his earnings to his employers. His meager monthly salary wasn’t enough to cover a day of his family expenses. Enter Adaneche, who’d had enough of her husband giving his hard-earned money away. “It always concerns me how my husband works so hard for others and didn’t get anything out of it,” she told the Roots Ethiopia staff. So, she did a proper market assessment and determined that the family needed 4,700 Birr ($127USD) to buy a cart for her husband. Adaneche then utilized one of the SHG membership benefits and petitioned for the cost of the cart to be covered in a loan from the Group’s revolving fund. She bought the cart! 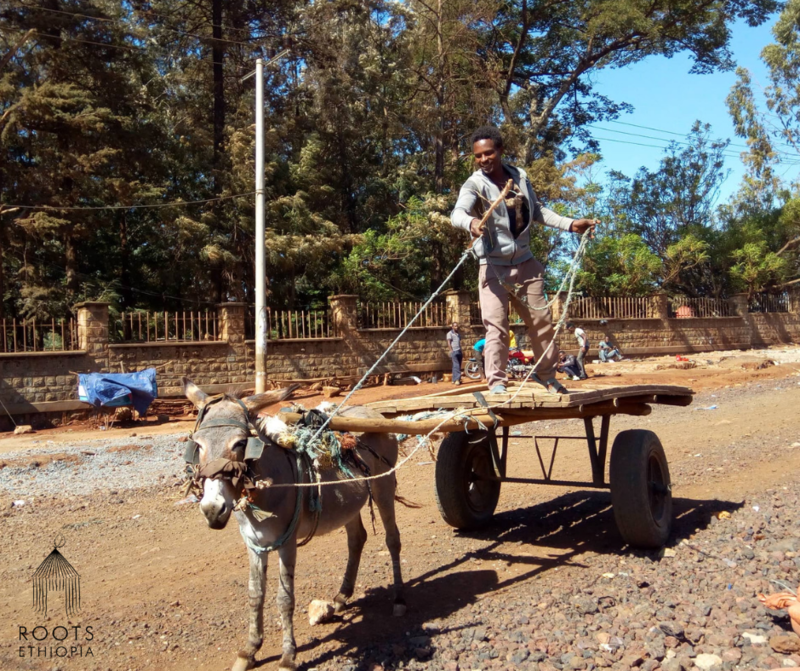 Yohannes must rent a donkey at a cost of 200 Birr a week but he makes double that driving his own cart. The family’s quality of life has improved dramatically and they are enjoying the pride of ownership. Meanwhile Adaneche continues to dream. She and her husband are working to pay back the investment to the SHG and then she will borrow again to purchase their own donkey. She understands that the real way to get ahead in business is to invest in yourself first. And Roots Ethiopia will be behind her every step of the way. UPDATE IN FEBRUARY: Adaneche and her husband have now bought a donkey and the business is SO BUSY! Check out her husband’s smile as he shows off his great business.